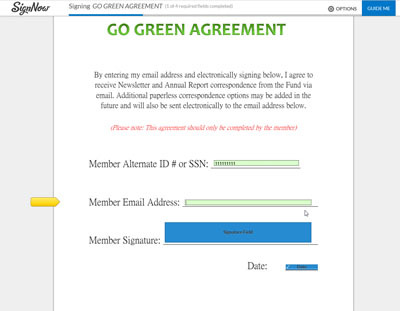 By entering your email address and electronically signing using the Go Green link below, you give consent to receive Newsletter, Annual Report, and SPD correspondence from the Fund via email. Additional paperless correspondence options may be added in the future and will also be sent electronically to the email address below. You have the right at any time to receive, free of charge, a paper copy of any of the correspondences mentioned above, upon request. You have the option at any time to opt out of this agreement. You may do so by contacting the Fund Office at 1-800-765-4239 or by emailing info@neca-ibew.org. If you ever need to update your preferred email address, you may do so by contacting the Fund Office. The Fund Office is providing this option to save on postage costs and to help the environment. If you would like to continue to receive paper copies by regular mail, you do not need to take any action. 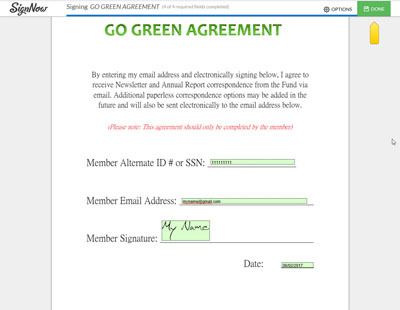 If you would like to Go Green, please click the link below to enter your email address and electronic signature to agree to receive correspondence electronically via email. Note: more types of correspondence may be added to this list. By signing up to Go Green using the link above, you agree to receive via email any other correspondence that is added to this list. Please note that Explanation of Benefits (EOBs) will continue to be sent via regular mail. 1. Click the Go Green link and then click Get Started when the link opens. Then follow the yellow arrows. 2. Enter your Alternate ID or SSN. 4. 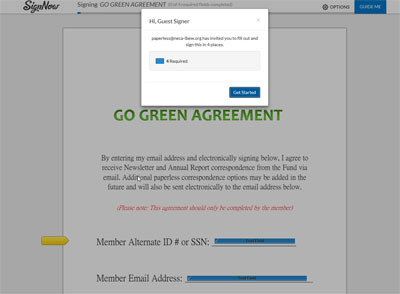 Click in the Member Signature field on the agreement to open the Signature box. 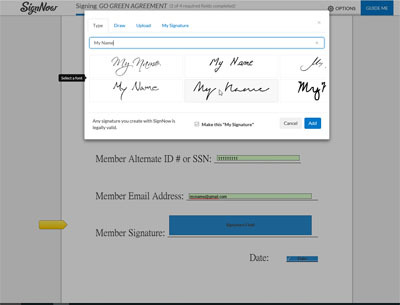 Delete the words "Guest Signer", enter your name, choose a font, and click Add. Note: you may also choose another option such as Draw, Upload, or My Signature). 5. Click on the Date field and the current date will be filled in. Then go to top and click Done. 6. When you see the following message, you are done. You do not need to select one of the options unless you want to. 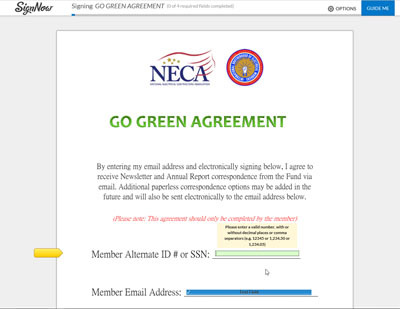 One will allow you to save the document you just completed, and the other will access the SignNow app. If you would like to rescind this agreement, please notify the Fund Office.